A truce has brought a reduction in violence in the Iraqi city of Falluja after US troops fought insurgents there during a two-week siege. There was little media access during the fighting, but eyewitness reports are now emerging. 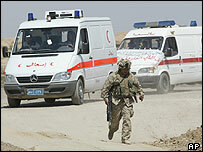 Humanitarian workers speak of US soldiers firing at ambulances and civilians. They say makeshift clinics were overwhelmed because of a bridge closure which cut off access to the main hospital. US military officials have described the US operation as "humane" and say they "do everything possible to protect non-combatants". But they say insurgents' tactics are increasing the risks for civilians. Coalition forces began the operation to "pacify" insurgent fighters in the restive, mainly-Sunni city on 5 April. It followed the gruesome murder and mutilation in late March of four security contractors working for the coalition in the city. British aid worker Jo Wilding said an ambulance she was in, with flashing lights, siren blaring and "ambulance" written on it in English, was hit as it drove to collect a woman in premature labour. Ms Wilding is sure the shots came from American troops. "You can tell the shape of US marine from a mujahideen - even if you can only see a silhouette, the helmet and flak jacket are quite distinctive. Also, we were in a US-controlled part of town," she told BBC News Online. Three days into the siege, Lt. Gen. Ricardo Sanchez, the top commander of U.S. forces in Iraq, denied that troops were firing on ambulances. "If we're shooting vehicles, it's because those vehicles have shot at us," he said. US officials have said that on one occasion, an insurgent gunman was seen fleeing in an ambulance, and that weapons have been found in an aid convoy west of the city. 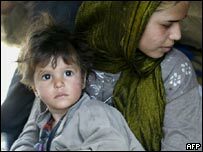 Coalition military spokesman Brigadier General Mark Kimmit said that there have been "a lot of people running around the city with blankets on their vehicles asserting that they are ambulances". There was concern that these could have been loaded with explosives, he said. Reports from the city have consistently said that many civilians in US-controlled parts of the city were too afraid of US snipers to leave their homes during the siege. Dr Obaidi and Ms Wilding described cases of women, children and old men who appeared to have been shot by US soldiers. Ms Wilding said an injured mother and two children had told her they were hit by US gunmen as they tried to leave their house. She also said she met an old woman, shot in the abdomen, who was still clutching a white flag. "Her son said she had been shot by US soldiers," Ms Wilding said. 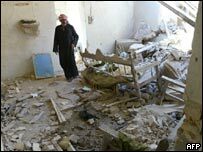 Dr Obaidi also said he had seen the body parts of a family in a bombed-out house: "There were seven women and five children. I saw the head of a child away from the body. Only one girl, aged four, had survived," he said. Doctors set up makeshift clinics in the early days of the siege. Ms Wilding said doctors were storing blood in a drinks fridge at a GP's surgery where they were treating the injured, and warming the bags under the tap in an unhygienic toilet. Dr Obaidi said hundreds of patients were brought in, but his team had only 10 beds. Part of the deal to end the fighting was a US commitment to allow "unfettered access" to the hospital and to "facilitate the passage of official ambulances" in the city. The Coalition says troops "have consistently allowed food, medical and humanitarian supplies into the city" and have "assisted in the transportation and distribution of these supplies". 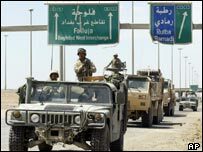 It also says marines have helped ambulances from Baghdad to get into Falluja, and that humanitarian convoys have been slowed by explosive devices found on the roads. "Holed up in a battered building US troops are still exchanging heavy fire"